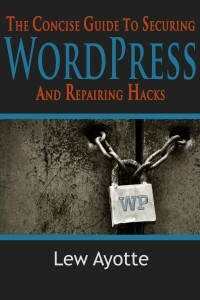 The Concise Guide to Securing WordPress and Repairing Hacks is available today on Amazon Kindle for 99 cents. You can also “borrow” it for five days from your Kindle for free. I have been developing WordPress themes and plugins for over five years now and have dealt with my share of clients whose sites have been compromised. Over the past few months I have seen an large influx of clients whose sites have been hacked, usually from outdated version of WordPress or insecure passwords. Some of these hacks have been very sophisticated, unlike any I have dealt with in the past. Unfortunately, just updating WordPress or changing your password is not enough if your site has already been compromised. So I wrote a simple and concise guide explaining everything I do or recommending doing to help secure a WordPress installation. This guide is just over 6,000 words. This is truly a guide, its purpose is to aid users of WordPress in securing new and old installations of WordPress to defend against malicious hacks and to guide users in repairing and cleaning their hacked sites. This is not a self-contained user guide; basic knowledge of WordPress, Themes, Plugins, PHP, and MySQL is expected. Some linux experience would be helpful but is not necessary. This guide is also not complete; every day hackers become more clever with their techniques and new security flaws are bound to be discovered and exploited, however this guide is designed to give you the set of skills necessary for securing WordPress and repairing hacked versions WordPress. The Concise Guide to Securing WordPress and Repairing Hacks is available today on Amazon Kindle for 99 cents. You can also “borrow” it for five days from your Kindle Library for free.